Foolish Things comprises of Arthur Parkes and Mia Mannion, each professional musicians of many years standing, both solo and together. Since their beginnings – as ‘EXPO’ – they have worked in the Channel Islands, the UK, Scandinavia, Northern Europe and (through Milanese impresario Piero Massari) extensively in the Middle East/Gulf region – Abu Dhabi, Dubai, Bahrain and Damascus – as resident band in Sheraton, Novotel and Holiday Inn hotels, where they played not only bass and guitar but also keyboards and saxophones. In more recent years, as well as teaching music (guitar, bass, saxophone, clarinet) they decided to ‘forget about carting around half a ton of equipment’ and re-invent themselves as ‘FOOLISH THINGS’ – the guitar and double-bass vocal duo. 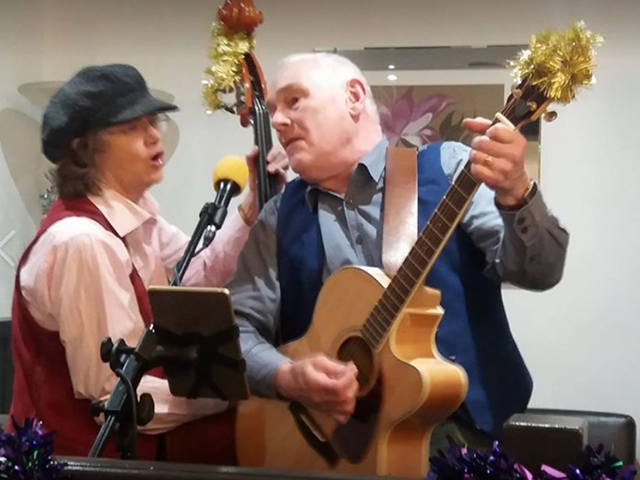 Now focusing on (as they put it), ‘having fun and being at last permitted to play some of our own original songs as well as top covers,’ they are guaranteed to liven up any occasion.